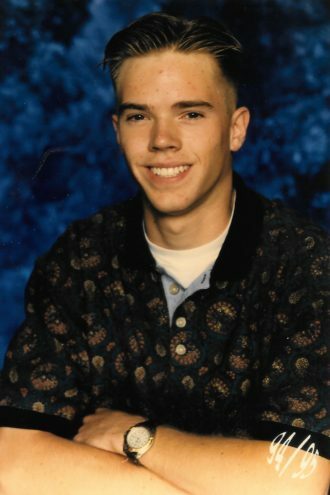 Clay Jones, like other 16-year-olds in North Texas circa 1995, loved playing football, spending time with his family, and Guns N’ Roses. Clay Jones was 16, playing junior varsity for Forney High, when he was hit by lightning at practice. His story would change Texas high school football forever. 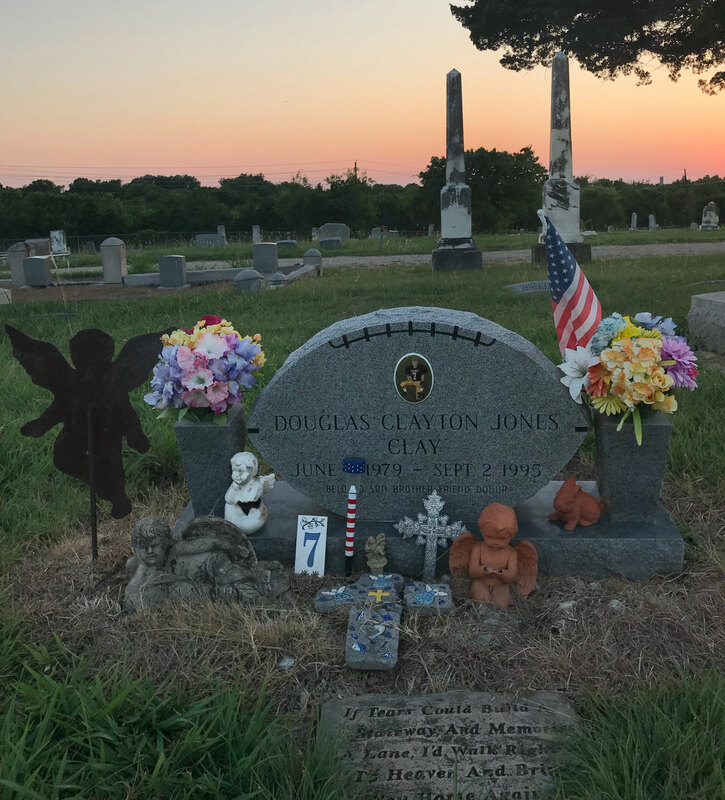 Clay Jones’ gravestone is in the shape of a football. It sits near the middle of a cemetery in Forney, about a half-mile from the yellow house on Center Street he grew up in—the baby of the family, who became an athletic and sports-crazed 16-year-old. If you leave the cemetery and head east down the dirt road, it’s one mile to the old field where he spent so many hours playing football, back before the Forney High School Jackrabbits played in City Bank Stadium, back when practice and games took place on modest grass turf. Drive south past the old high school, and it’s 18 miles to Kaufman, where, one afternoon in August 1995, football players for Kaufman High told their head coach that it “felt electric outside.” If you instead hang a left and turn on to Highway 80, it’s 20 miles to the Baylor University Medical Center. It’s there that, as Clay Jones lay in a hospital bed late one summer more than two decades ago, his mother took note of the red dot on her son’s foot, where the lightning bolt had exited his body. In the nearly 23 years since Clay Jones was flown by helicopter from that old football field in Forney to a Dallas hospital, high school football teams throughout Texas have adopted new safety measures to protect players from inclement weather. The Clay Jones Legacy Foundation was set up to support graduates of Forney High, giving new opportunities to students. And the donation of Clay’s organs helped save lives, raising awareness of an issue that would save countless more. It’s 790 miles across Texas, and Clay’s story has touched nearly every corner of the state. Linda Jones had just backed out of the driveway on Aug. 29, 1995, on her way to work, when she realized she hadn’t hugged her youngest son goodbye. She pulled back in and put the car in park. By that time Clay—who had earlier, in a very sleepy-teenage-boy way, mumbled something resembling “good morning” to her—was about to jump into the shower. “Have a great day,” she told him as she wrapped him in a hug. It was a Tuesday morning—a hot, sticky one—and while his mama headed off to work, Clay showered, got ready for school, and loaded in the car with a friend to make his way to Forney High. His parents had decided not to put Clay into kindergarten until he was six, making him one of the oldest in his grade and a natural leader among the Class of 1998. Clay was one of those kids that his peers and teachers loved, and he was later described as a “people collector.” It didn’t matter who they were, Clay was a friend to everyone. Kindness shone through his bright blue eyes. Clay had just started his sophomore year as a Jackrabbit, playing on defense for junior varsity. He was beyond ready to get his driver’s license, and had recently gotten stitches taken out of his chin. The stitches had been put there by one of his best buddies, Russell Bannister, while the two were playing football. “That’s what we thought constituted an emergency prior to August 29,” Linda says. It was the first week of school, and football season was about to get underway. For the players and coaches, Tuesday just meant another miserably hot practice after class. The air was heavy with the smothering, thick heat that hangs over North Texas in late August. A cluster of dark clouds hung low, miles away. But in Forney the sun was still out, and it bored its heat into the field. The temperature reached 105 degrees that day. There were close to 100 players practicing that day on the field behind the high school, gearing up for the first game of the season. About 40 minutes into practice, the team was split up to run drills. Clay was running plays with the secondary in Coach Brad Turner’s drill group. It was an ordinary preseason practice, but Turner remembers looking up at the sky, thinking that they would probably end up having to go in early if the storm clouds he saw made their way north, toward the field. With the sun baking the Panama straw hat on his head, Turner gathered his group of players to go over alignments for a play formation. There was a deafening, violent crack. “It was the most unbelievable sound, a loud boom, and I’m facedown in the grass,” Turner says. The electricity, balancing itself, discharged to the ground—a flash of light traveling at 750,000 miles per hour—slicing into the Jackrabbit field, right inside Turner’s defensive drill. Assistant coach Kevin Rush says, “later, we found out that the bolt had originated twenty-something miles away.” Everyone hit the ground in bewilderment, if they hadn’t already been flung to the grass when the lightning hit. With ears ringing and heads pounding, coaches yelled for them to get inside. Players sprinted from every direction to get to the field house for cover. When Turner peeled himself off the grass and looked back, he noticed that everyone in his group had been slammed to the ground. There were a couple of boys that didn’t get up. One of them was Clay, lying on his back. Others were injured—one player with a burn on his hip where lightning had exited his body, and some who felt out of sorts and dizzy, with concussion-like symptoms. But Clay didn’t move. It didn’t look like he was breathing. Away from the chaos on the field, the players in the field house weren’t sure what was going on. Kyle Abshire, then a sophomore who played defensive line, says the group of teenagers in the field house had no idea of the gravity of the situation until someone raced into the coaches’ office, desperate to reach the phone and dial 911. Turner and Maxfield kept their hands on Clay’s chest, working feverishly until the ambulances arrived, followed by a CareFlite helicopter. Light rain began to fall from the sky in a mist, coating the grass with dew. Not a storm, just a summer shower. “We had such a violent bolt of lightning and then to have a shower that was just calm—it was kind of weird,” Rush says. At the time of the lightning strike, the city of Forney only had a volunteer fire department. One of the volunteers, Rick Townsend, was a lieutenant in the Garland Fire Department and one of the only paramedics in the volunteer coalition. On the afternoon of the 29th Townsend was on a fire engine, responding to a call about a car accident on Interstate 20. Townsend, who has served as Forney’s fire chief since 2006, made his way back to the field after a quick response to the accident on I-20 and, as one of the only paramedics, worked for “quite awhile” on Clay. Clay was loaded onto the helicopter and flown from what had been a typical football practice—the kind where sweat drips from the crown underneath your helmet and nothing tastes as sweet as a sip of ice water—to Baylor, where a cold room waited with machines to keep him alive. Dozens of people packed the waiting room at Baylor that night, waiting for news on their injured teammate and friend. Clay’s friend Russell—the buddy responsible for those stitches on Clay’s chin from a few weeks before—remembers the car ride on the way home from the hospital, when he talked to his mom about how awful it was that Clay might not be able to play football again. He hadn’t thought of the possibility that his friend might not come home. The blonde-haired athlete—who loved Guns N’ Roses, joking around with his friends, spending time with his mom, dad and two brothers, and who had just recently checked the box to be an organ donor—didn’t wake up. On day five of Clay’s hospital stay, his family was told that there wasn’t a lifeline for their son. He was on a breathing apparatus and life support. Clay died Saturday, not even a week after his mom caught him for a last-second hug. Not even a week after he made his way out of the locker room to practice, and not three months after he turned 16. Clay’s mom looked at him, and said, “Well, we have a few minutes to get there. What do you want to know, and what do you want to talk about?” Clay turned back to her and said matter-of-factly, “Well, I just don’t know why anybody wouldn’t be an organ donor if they could no longer use their [organs]. Clay’s death put organ donation in the spotlight in Texas, and his eyes, kidneys, and bone and tissue grafts went to people all over the state. A video describing his story played in Texas defensive driving classes for years. Teenagers in North Texas worked to get their peers to sign up as donors, and Linda became an organ donation advocate. In his death, Clay did more than save lives. Clay’s legacy goes beyond organ donation. 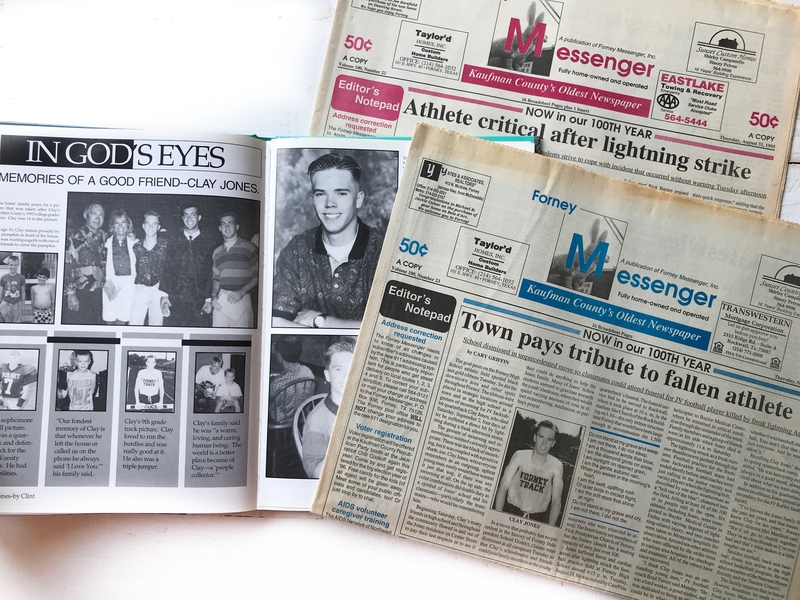 In 1995, there were thousands of high schoolers across the state playing football, and, in turn, there were thousands of high schoolers susceptible to a lightning strike at practices and games. “Pre-Clay,” it wasn’t the norm to carry around lightning detectors and spend precious playing time staring at the sky during practice. If a thunderstorm got really bad, the teams would go in. There was no need to go inside for clouds off in the distance or a little rain. Glen West, an assistant executive director of the Texas High School Coaches Association, was the head coach in Kemp when Clay was struck by lightning. The coaches in Kemp were good friends with the ones in Forney, and they, along with coaches from districts all over North Texas, came to Clay’s funeral. Clay’s death shook the Forney community. At the time, Joe Martin, now an assistant executive director for THSCA, was coaching at Garland High. The day after the lightning strike, Martin went to talk to Garland ISD’s athletic director, Homer B. Johnson, about those handheld lightning detectors from Texas Christian University. By the next day, Johnson had bought seven of them: one for every high school and one for each Garland stadium. Immediately, athletic departments across the state tried to find a way to get their hands on lightning detectors. Eventually, almost every sports program had some kind of lightning detector. Now, smartphone apps give coaches and athletic officials the ability to track the weather from the screens of their phones. “A lot of education took place because no one knew—or, at least, we didn’t know—that lightning could travel (from) that far away,” says Rush, the assistant coach from Forney. Texas Senate Bill 82, adopted years after Clay’s death, requires all coaches and sponsors of athletic activities to complete a safety training course. Chapter 76.1003 of the Texas Administrative Code states that “each school district shall ensure and maintain documentation that each person subject to the TEC, §33.202, has satisfactorily completed the extracurricular athletic activity safety training program required.” Lightning safety is section five of that training. Now, Texas Education Code has made it clear that every single coach, sponsor, trainer, marching band director and doctor employed by the school district must learn about lightning safety. The University Interscholastic League’s lightning recommendations state that a chain of command must be established, in which someone, typically an athletic trainer, is designated to watch the weather. If necessary, the designee passes the information up the chain and the appropriate person will call the game to be delayed. If stormy weather is imminent, all play should be suspended until the storm has passed. Should thunder be heard within 30 seconds of a visible lightning strike, everyone seeks shelter until at least 30 minutes have passed. Clay’s gravestone in Forney is shaped like a football. If this training had been required 23 years ago, there’s a possibility that Clay Jones would be walking around today, 39 years old and with a family of his own. However, there’s no question that the safety protocol put into place since has prevented deaths and serious injuries. That’s part of Clay’s legacy. Clay’s death put a stop to any sort of idea that the game was bigger than nature. Several of the players who wore a Jackrabbit jersey in 1995 now have teams of their own. The coaches on the field that day have spread all over Texas. Head coach Mel Maxfield left Forney after 15 seasons and now coaches in Monahans, near Odessa. Kevin Rush recently retired after 27 years at Forney High School. Terry Gambill holds a prime position as the top coach in Allen, and Brad Turner directs scouting for National Preps. Clay’s friend Josh Ragsdale is now the head coach at South Garland High School, working alongside Clay’s old teammate, Kyle Abshire. John Garcia, a varsity player at the time of Clay’s death, worked under Coach Rush for years. Russell Bannister is a lieutenant for the Forney Fire Department, working with Chief Rick Townsend. Linda and Barry Jones, Clay’s parents, are in the same house on Center Street. It’s been almost 23 years since Clay’s death. Still, something holds all of these people together—a blue-eyed boy, a strike of lightning, and a heart that wasn’t ready to stop giving, long after it had given out.